In which we meet monsters. Superman, duh. Prior to this event he hasn’t met or heard of the Elite before; this is where they make their debut. Voiced by George Newbern. 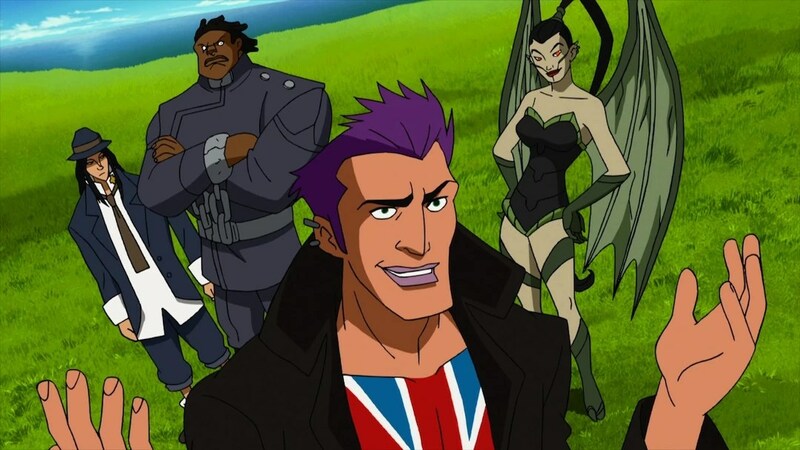 Manchester Black (sometimes shortened to “Chester”), leader of the Elite and a lower-class Brit with a punk look. Gifted with inherent psychic abilities. Black’s telepathy lets him read (most) people’s minds, project his thoughts to others, and launch mental attacks directly at the victim’s brain. His telekinesis allows him to lift objects and people with his own mind, as well as project waves of raw force (portrayed in the film as a glowing green energy). Quick-talking and humorous, but also crude and more than a little shady. Mostly an analogue of the Authority’s Jenny Sparks. Voiced by Robin Atkin Downes. Coldcast aka Nathan Jones (real name never said in the film). An American and the Elite’s bruiser, Coldcast’s powers are electromagnetic in nature. He can absorb and discharge many different types of energy, an ability which also seems to enhance his physical strength and durability greatly. Voiced by Catero Colbert. Menagerie, aka Pam– unlike Coldcast, her superhero name is the one never used in the film; everyone seems particularly chummy with her. The team’s lone woman, she has a reptilian appearance, with leathery bat wings that allow her to fly with surprising speed and dexterity. Her real value, though, comes from the seemingly unlimited number of deadly slugs she can generate from her body and control remotely. The slugs (apparently the result of bonding her to an alien weapons cache) have a surprising number of offensive capabilities, and she can even use them to briefly enhance her senses. She’s supposedly Puerto Rican, which I don’t buy because not ONCE does she have a hilariously dramatic outburst of anger. Mostly an analogue of the Authority’s Swift. Voiced by Melissa Disney (yep, from those Disneys). The Hat, an Asian man (Japanese in the comic but implied to be Chinese here, and he speaks perfect American English anyway) with mystical powers seemingly centered in his normal-looking hat. The hat’s powers are vague but vast; he generally uses it to summon enormous creatures but it can produce other effects as well. The Hat’s body is also said later to be protected by a magical field, thus minimizing his potential for injury. Clearly an analogue of the Authority’s Doctor, with whom he shares not just similar magical powers but also a substance abuse problem– the Hat is clearly an alcoholic. Voiced by Andrew Kishino. An enormous monster. The product of Pokolistan’s biological weapons division. Resembling nothing so much as a giant, weird, weaponized cockroach, the monster walks on four enormous legs and has an extra limb in its mouth, as well as dual retractable laser cannons on its back. Incredibly strong and durable. Apparently capable of multiplying itself at will. It’s… well, it’s like something a child would design. Voiced by a bunch of inarticulate sound effects. The Setup: In the aftermath of the previous tussle with Atomic Skull, Superman showed up in person at the United Nations in order to attend to some sort of debate/lecture about the role of superheroes in society (because that’s the sort of thing the UN does, I guess?). Superman admirer Professor Efrain Baxter plays devil’s advocate for the crowd, pondering if these repetitive battles (the previous one cost millions of dollars in property damage, apparently), marked by restraint are really the best way to defend against evildoers. Should those with power not be more proactive and seek more definitive solutions? Is it time to take the kid gloves off? Superman answers in the negative and says that his ideals are worth sticking to, even when things get difficult. The event is interrupted by news that violence between Pokolistan and Bialya (two fictional Middle Eastern countries; presumably the writers made up fake ones so as to avoid offending any *actual* Middle Eastern countries by suggesting they’re constantly locked in pointless wars) has flared up again. Superman flies off to the war zone, seeking to do what he can to minimize damage. Instead, he arrives to find that rumors of one side deploying WMD in the conflict are true, except that in Pokolistan the “M” stands for “monster,” as Gamera’s retarded cousin is tearing things up left and right. The Fight: Superman gets some Bialyan regulars (their weapons are no match for the creature’s thick hide) away from the thick of things, and is surprised to find that Coldcast is already blasting away at one of the beasts, albeit ineffectually. Menagerie flies by and lodges about a dozen slugs along the back of the creature’s spine, which causes it to split in half right down the middle. This apparent victory is short-lived, however, as each half grows another new half, forming two monsters each the size of the previous. Whoops. Superman is able to fly in and knock one monster on its back, but it recovers and cheap shots him through a building just as he goes to town on the other one. It seems like a stalemate, but the hero is soon contacted telepathically by Manchester Black, who, while watching from a distance, tells him that the monsters are brainless and technically not even alive (which he confirms with X-ray vision), so he’s free to use extreme force. A few passes with super breath freezes one monster solid, leaving Superman free to shatter it in a thousand frozen chunks with a single blow. This one’s a bit underwhelming, and more than a bit silly. Giant bug-monsters as a form of warfare is a kind of bonkers-fun idea, but the creatures themselves are, for all their strength, a bit underwhelming. Not to mention they’d probably be inefficient in traditional combat. Plus they present all sorts of logical/science Fails: if they don’t have brains, how are they controlled? If they can multiply at will, why not send in two (or more) to begin with? And when they multiply, where does all that extra mass come from? They’re dispatched a little perfunctorily as well. The freeze/smash thing is a nice, but the Hat’s swallowing act is a abrupt, and this, the first combat use of his power, is shockingly broad: if he can simply absorb anything he wants into his magical hat, you wonder why he doesn’t just do that every time. The fight does a handy enough job of introducing the Elite one by one, with a nice if hardly thorough demonstration of their abilities. Too bad it’s short and a touch on the goofy side. Fortunately there’s better to come. Coming Attractions: Your second-favorite flaming skeleton returns. Your first favorite damn well better be this guy. This entry was posted in Superman vs The Elite and tagged melee, sci-fi, superheroes, Superman, Superman vs The Elite.